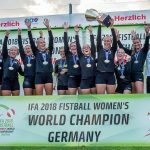 14 games are scheduled on the second day of the IFA 2018 Fistball World Championship in Linz. The series of matches starts at 1 pm with defending champion Germany playing against Serbia, and Argentina versus Poland, respectively. Host nation Austria will face newcomer New Zealand in the next match of the day at 1:45 pm. It will be a special game as two sisters will play against each other – Karin Kempinger representing Austria, and her sister Birgit coaching New Zealand. Usually they play together in the defense of FBC Linz Urfahr, but today they are on two different sides. While Austria has been a world-class team for many years, winning four medals in the last seven World Championships, New Zealand is a newcomer starting for the first time. “It would be a big surprise if we can bring Austria under pressure”, says Birgit Kempinger. Her contact with the young fistball nation New Zealand came about earlier this year when visiting the country. “I only wanted to do one practice session with the team, but I was welcomed so cordially that it evolved into a training-of-trainer course.” For a full day the Austrian taught the basics of fistball to the New Zealanders. There is a lot of enthusiasm for fistball in the country. Birgit Kempinger also appreciates the overall work on sports in New Zealand, “They are extremely professional there”. New Zealand has impressed in its two preliminary round games thus far. In particular Vice World Champion Brazil had a hard time with the New Zealanders. “The players work hard and are very committed”, says Birgit Kempinger. Karin Kempinger already plays her third World Championship after the tournaments in Dresden and Curitiba. Following a second place in 2014 and a fifth in 2016 her goal for 2018 is to again win a medal. “Austria is surely one of the top contenders. I think they will make it to the final”, says sister Birgit who also worked in the organizing team of the World Championship. For her own team New Zealand she hopes to reach the final of the Presidents Cup, that is the game for the ninth place.